The example consists of a single Window class, containing a selection of line edits with different input constraints and display properties that can be changed by selecting items from comboboxes. Presenting these together helps developers choose suitable properties to use with line edits, and makes it easy to compare the effects of each validator on user input. 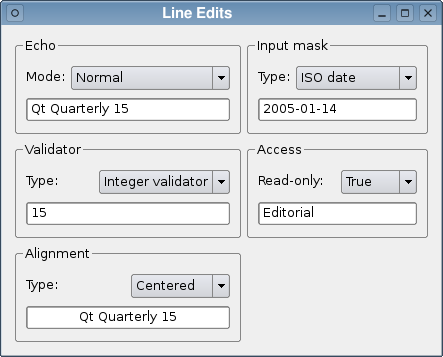 The slots are used to update the type of validator used for a given line edit when a new validator has been selected in the associated combobox. The line edits are stored in the window for use in these slots. The Window constructor is used to set up the line edits, validators, and comboboxes, connect signals from the comboboxes to slots in the Window class, and arrange the child widgets in layouts. At this point, none of these widgets have been arranged in layouts. Eventually, the echoLabel, echoComboBox, and echoLineEdit will be placed in a vertical layout inside the echoGroup group box. Each of these connections use the QComboBox::activated() signal that supplies an integer to the slot. This will be used to efficiently make changes to the appropriate line edit in each slot. The slots respond to signals emitted when the comboboxes are changed by the user. The slot updates the line edit in the same group box to use an echo mode that corresponds to the entry described in the combobox. The slot either creates a new validator for the line edit to use, or it removes the validator in use by calling QLineEdit::setValidator() with a zero pointer. We clear the line edit in this case to ensure that the new validator is initially given valid input to work with. This changes the way that text is displayed in the line edit to correspond with the description selected in the combobox. Each entry in the relevant combobox is associated with an input mask. We set a new mask by calling the QLineEdit::setMask() function with a suitable string; the mask is disabled if an empty string is used. Here, we simply associate the False and True entries in the combobox with false and true values to be passed to QLineEdit::setReadOnly(). This allows the user to enable and disable input to the line edit.